The average adult needs about half a milligram of folate a day. In areas where people don’t get that much, pregnant women give birth prematurely, babies have low birth weights and nervous system defects, children don’t grow and adults can experience a wide range of maladies, including anemia, diarrhea, headaches, behavioral disorders, heart disease and even cancer. With Jesse Gregory’s research in folate and other B vitamins, they may not have to. Gregory’s research with Andrew Hanson from the horticultural sciences department has led to a process called folate biofortification, in which plants can be generated with a higher folate content. 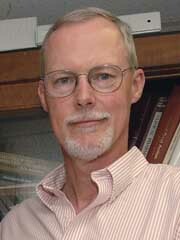 For the last nine years, Gregory’s research group has contributed to this research effort by providing the necessary analytical methods for measurement of folates in plant tissues and cells, while Gregory also has contributed by evaluating the contributions of such dietary folates to nutritional adequacy and human health. In addition to studying folate in plants, Gregory has also tracked the vitamin within the human body. This aspect of his research involves introducing nonradioactive isotopes into various vitamins and metabolites in order to watch how they move, interact and function in the body. Since Gregory’s research uses stable isotopes rather than traditional radioisotopes, there is no threat of radioactivity and no danger for human subjects. Gregory has also studied the properties of vitamin B-6, a necessary component of many of the body’s metabolic processes, which is necessary for adequate functioning of folate metabolism. His discoveries of enzymes related to B-6 bioavailability have shed new light on metabolism of the vitamin. His metabolic studies have led to new insight into nutritional requirements for both folate and vitamin B-6. Gregory has taught the graduate course Advanced Food Chemistry at UF every year for 25 years.